Peter Tristram ... "I got this beauty from Reginald de Roose a few years ago so this is my first flowering. It seems pretty easy to grow though slow, but a hell of a nice plant! It grows well like dyeriana or hamaeleana though not as cold sensitive. I hope it pups well! A T. stenoura Harms, cui affinis, planta per¬minore, scapo inflorescentiaque abbreviata et petalis albis differt; a T. abbreviata Luther, cui similis, foliis attenuatis et bracteis florigeris per majoribus differt. Type. Ecuador: Prov. Zamora-Chinchipe, S of Yangana, 59 km S of Villacabamba on road to Zumba, 1,900 m; January 1990, J. Raack & J. Kent 22 (SEL, holotype). Plant flowering to 20 cm tall. Leaves densely rosulate, erect, to slightly spreading, to 24 cm long, appressed punctate lepidote throughout, es¬pecially abaxially. Leaf sheaths broadly elliptic, 7-9 x 4-5 cm, abaxially pale, adaxially pale proximally, dark reddish purple distally. Leaf blades ligulate, attenuate, 12-16 mm wide, light green heavily suffused with reddish purple with occasional darker spots, the color apparently intensifying upon flowering. Scape erect, 6-8 cm x 2-3 mm, about equalling the leaf sheaths. Scape bracts erect, densely imbricate, subfoliaceous, colored like the leaves. Inflorescence densely digitate, 3-branched (rarely simple), to 8 x 5 cm. Primary bracts elliptic, attenuate, much shorter than the branches, colored like the leaves. Branches with a 2-4 mm long sterile base, erect to slightly spreading, complanate, distichously 13-18-flowered. Floral bracts elliptic, acuminate, slightly incurved apically, 30-35 mm long, carinate, thin coriaceous, lustrous, pale green, glaucous, appearing white in life. Flowers with a 1-2 mm long pedicel, slightly spreading, opening during the morning. Sepals linear, acute, 26 mm long, the adaxial pair carinate and 1-2 mm connate, pale green. Petals ligulate, obtuse, cucullate, 30-32 mm long, white. 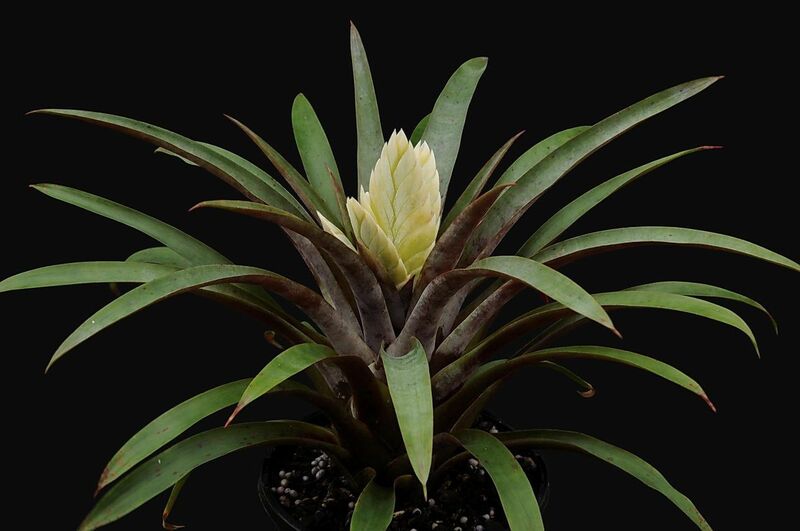 Tillandsia raackii is related to T. stenoura but differs by being much smaller [20 cm vs. 50-150 cm tall] with a very short scape and inflorescence. 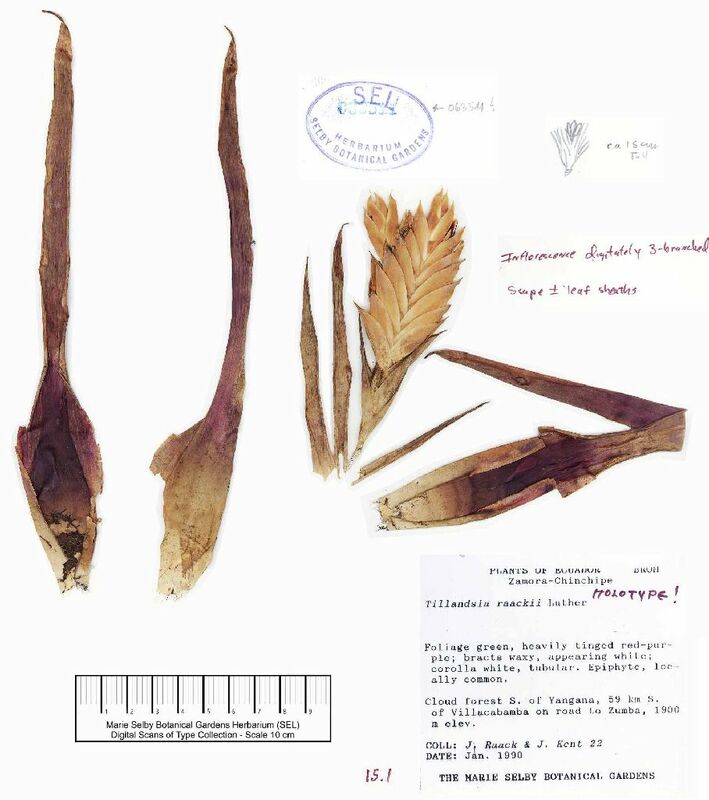 From the superficially similar Colombian T. abbreviata, this new species may be distinguished by its attenuate leaf blades and larger floral bracts [30-35 mm vs. 19-23 mm]. The name honors the collector, Jerry Raack of Pataskala, Ohio, who first brought this interesting species to my attention. In April 1997, I had the honor to join a collecting trip with Betty Girko and Ed Doherty of Dallas, Texas, and Jose Manzanares and Monica Navarro of Quito, Ecuador. Jose Manzanares led our group as we headed to southeastern Ecuador. One of the plants we dearly wanted to find was Tillandsia raackii H. Luther, a plant I had collected in January of 1990 with Jeffery Kent. I reviewed my notes and the slides taken around the area and was convinced that I could "easily" find the spot again. My notes said it was 59 km south of Vilcabamba on the road heading toward Valladolid in the province of Loja at 1900 meters in elevation. Well, anyone who has ever collected knows that 59 km is a long way to measure from any point, but especially in this area. There must be a million things to grab your attention in that length of road; especially since it is prime country for bromeliads of all types. Once you stop, then back up, move forward and repeat this quite a few times, the 59 km quickly becomes an approximate distance! However, I could still picture the place where it should be. I remembered that the plant was found on a ridge, which went down from the road to the right as the road made a left hand turn. I knew the area was fairly steep, as is most of the area in this part of the country. I also knew that we had not been able to see the plant from the road, but that it had occurred not far off it growing in trees from 2 to 7 meters off the ground. It was an area that is wet as is typical around this part of Loja. Of course, my biggest concern was that in the 7 years since I had originally collected it, the area might have been logged and devastated; there were no guarantees. Adding to the mystery was the fact that Harry Luther had informed me that no one since had reported having seen the plant. It was mid-afternoon when we arrived in the area. We had kept accurate records (as best we could) as to how far from Vilcabamba we had traveled. As we got closer, all of the left hand bends in the road started looking alike. We stopped at one and started searching. We did not find T. raackii, but did find another plant I had also wanted to re-collect: Guzmania besseae H. Luther with its brilliant red inflorescence and bright white flowers. But still I wanted to locate T. raackii. We tried another bend, but again we could not find the plant. The group decided to have lunch. I was possessed at this point and continued to walk down the road to the next bend, and then the next. Finally, I climbed a small bank where the road had cut through and started down a muddy path used by the native people. It was steep, but looking out, I spied what I had been looking for...T. raackii. It was in bloom about 20 feet up in a tree in plain sight. I was excited, but could not get to this particular plant. I searched a bit more and found another one within reach of a pole I had cut. When I got it down, I raced back to the others still engaged in the last of their lunch. Excitedly I showed them my prize and within minutes we were packing up getting ready to move down a couple of km to where I had marked the spot. When we arrived, we eagerly made our way down the steep muddy path. We all spied plants in the trees. It was quite dark in the dense forest as the sun was blocked from view by clouds. The inflorescence of the plant is nearly white, contrasting sharply against the dark wine-red foliage at time of bloom. We were fortunate enough to see one of the T. raackii in bloom being visited by an unknown hummingbird. This is likely the natural pollinator of this species whose flowers do not open. 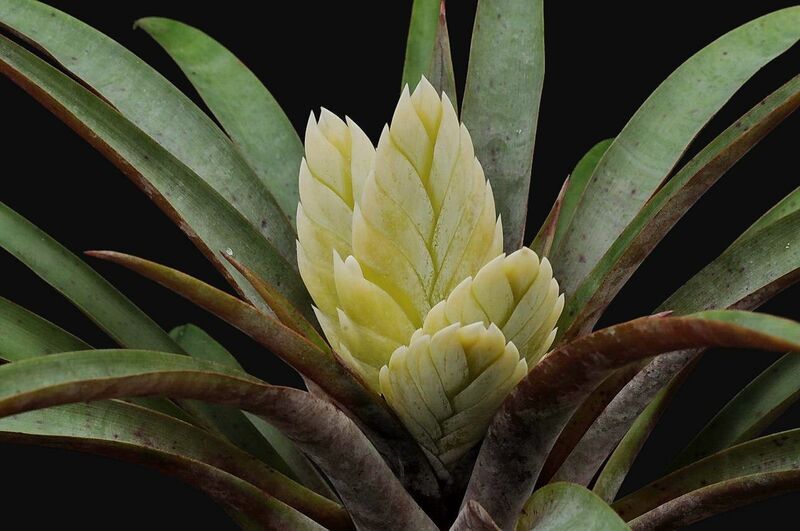 When you first see it, this soft-leafed tillandsia looks just like a vriesea. The plant turns a wonderful reddish color on the top surface of the leaves, sometimes being spotted, and are somewhat discolorous beneath, which in addition to the waxy substance on some leaves provides a wonderful patina. The wax is more prevalent on plants grown in my greenhouse than those collected in habitat. The inflorescence has 3 to 7 flattened vriesea-like feathered branches 3 cm wide and 7 to 8 cm long, each bearing from 14 to 20 flowers with white petals which remain closed at the tip. The stamen and pistil remain entirely inside the closed flower petals. The flattened spikes appear to be bursting straight from the cup center. However, the spikes are actually attached to a stem about 3 to 4 cm long. All spikes are clustered from very near the same spot on the stem in a radiating fashion with no apparent pattern. In all, the plant is quite unique. 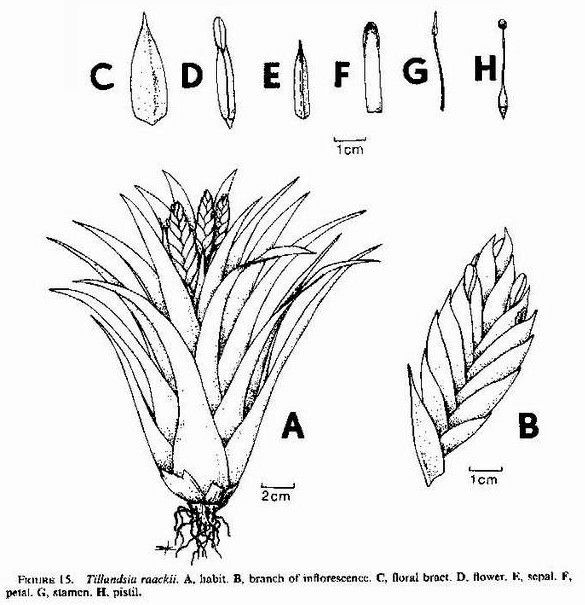 Harry Luther first described this plant in SELBYANA, Volume 12, pages 86-87 in 1991. So where were we when we found the plant? We were 38 km south of Yangana and at 1900 to 1950 meters in elevation. While we searched several of the ridges on either side of this one, we were unable to find the plant elsewhere. The range appears to be quite narrow being confined to this one location. 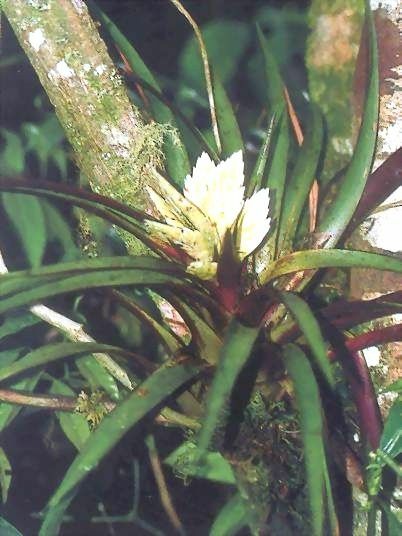 However, other bromeliads have started out in this fashion only to be found in other locales. In fact, I may have found one specimen in the Condor Mountains near Los Encuentros on the same trip. Time will tell whether it is the same species or not. Regardless, this plant from Los Encuentros will always be treasured by me. 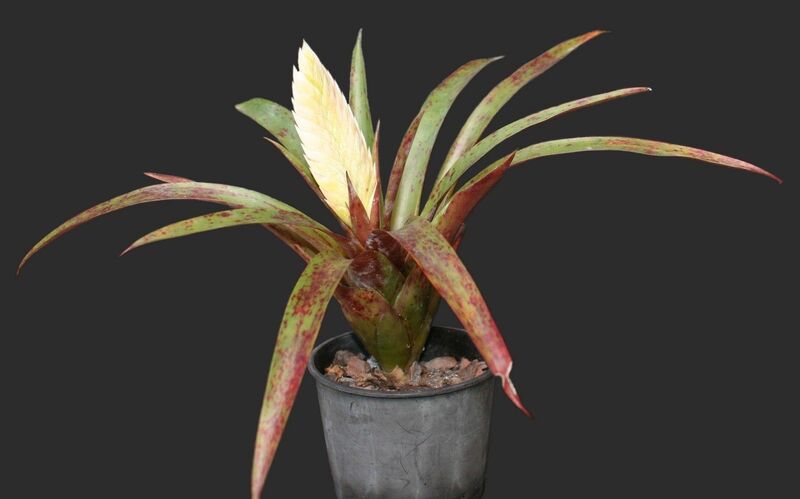 For those of you interested in owning a specimen of this plant, I will be donating one to the Rare Plant Auction at the World Bromeliad Conference in Houston, Texas in July of 1998. So come prepared and see this wonderful plant for yourself. Hopefully, in the near future, it will be popular and appear in many collections where it will rightly deserves a place among other fine bromeliads.